We invest with a 3 to 5 year timeframe, hoping to hold each position as long as possible, though knowing markets often overshoot to the upside as they do the downside. Given this reality, we understand that an infinite holding period is the exception, not the rule. We target the 3 to 5 year timeframe because while the market itself tends to price in a long duration, the average annual turnover of US stocks is over 250% per year, and consequently, the average transaction is premised on the quarterly newsflow of a given company rather than the long-term value proposition. This mismatch between the duration of equities and the holding period of the average investor is a crucial source of inefficiency in market valuations. Moreover, longer holding periods provide a tax advantage and minimize transaction fees. The essence of our strategy is based in the principles of Graham and Dodd and their progeny who focused on quantifying measures of quality and growth in valuation. emphasis, but not a mandate to invest in companies in developed markets. Target portfolio turnover of 20% with 30% being the high-end, though knowing in times of intense volatility turnover will have to rise to accommodate the rapidity of price action. No position size greater than 10% of the portfolio and no greater than 6% upon the commencement of the position. Invest opportunistically across the capital structure and amongst and between the various asset classes. Target companies with market caps between $500 million and $10 billion, though sometimes we will buy smaller or larger companies when the opportunity meets our risk reward profile. Philosophically we are not subscribers to the efficient market hypothesis (EMH). While the EMH takes physics and applies its principles to financial markets, we believe that financial markets exist in the domain of biology and can best be described within the Complex Adaptive Systems (CAS) framework. Markets are complex, meaning they are “complicated” and have “interrelated parts.” Markets are adaptive, such that they adjust to circumstances “by modification.” Markets are systems, which consist of “regularly interacting …group(s)” joining together to form a “unified whole.” This is very much our prevailing philosophy towards financial markets, and the reason behind our interest in the Santa Fe Institute. Such systems are found in many places, including nuclear physics, biology, anthropology, social structures, genomics, chemistry and drug discovery. The lessons from behavioral economics are particularly important in the CAS structure. Within this paradigm, we believe the combination of a robust process with sound temperament to be extremely important. Temperament is far too often taken for granted, and it is our belief that the EMH mistakes volatility for risk, when reality demonstrates time and again that risk is borne from the human response to volatility and not volatility itself. The most basic problem with the above question is how “Active Management” is simply painted with one brush. Active management has come to mean something very different over time. John Bogle, considered by many to be the “Father of Indexing” recently published a book about (and aptly titled) “The Clash of Cultures.” Bogle borrowed Keynes’ distinction of investing as “forecasting the prospective yield of the asset over its whole life” and speculation as “forecasting the psychology of the markets.” What most people think of as active management today is actually more akin to speculation and momentum trading than true investing. In practice, active management has become what we popularly call “trading” and this is evidenced by the explosion in portfolio turnover at the average investment fund. Bogle laments how “in 1950, the average holding [period] for a stock in a mutual fund portfolio was 5.9 years; in 2011, it was barely one year.” As of 2011, annual turnover of U.S. stocks was over 250% per year! This explosion in portfolio turnover has profound consequences for investors. Most frighteningly, it has created a system in which the vast majority of stock market participants are no longer real stakeholders in the success (or lack thereof) of our country’s publicly traded businesses. Is it any surprise that a 2004 working paper from the NBER found “55% of [corporate] managers would avoid initiating a very positive NPV project if it meant falling short of the current quarter’s consensus earnings?” This clearly indicates that management, in aggregate, specifically passes over projects that will increase a firm’s actual value (NPV=net present value) in order to smooth the trajectory of earnings. When the entire purpose of management is to maximize firm NPV and managers admittedly are not doing this because of their guess at how markets will behave, we know there is a problem. This should be shocking, though in practice, it is easy to rationalize. Corporate management is simply responding to the fact that the vast majority of investors are participating in the “Keynesian Beauty Contest” of predicting shifts in psychological sentiment rather than buying fractional ownership in real businesses. The existential purpose of a stock market is “to provide companies a means through which to raise capital in order to invest in their businesses, and [for] investors to allocate capital in order to generate a return.” These turnover numbers tell us that markets have moved very far from their essence. Today’s markets more closely resemble an arena in which strategists compete for increasingly low- margin arbitrage opportunities. And sadly, corporate managers have become willing participants in this game. In explaining the parable of Mr. Market we often reference Benjamin Graham’s observation that “in the short run the market is a voting machine, but in the long run it is a weighing machine.” This game of arbitrage is reflective of an important market reality: the short-term is the arena of randomness, while the long-run is the home of the investor. When people colloquially speak of “active management” today, they are implicitly speaking of this short- term arena because that is where so many of today’s market participants operate. As the domain of randomness, it comes as no surprise there is little persistence in returns from active investors other than amongst the bad ones. Bogle emphasizes that “beyond the crazy world of short-term speculation, there remain commonsense ways to invest for the long term and capture your fair share of the returns that are earned by our public corporations,” with the most important being a focus on the long-term, with an emphasis on the fundamental value of businesses. While Bogle’s name is inevitably tied to indexing, his point is far broader and applies to how active managers should operate as well. From the beginning, RGA Investment Advisors, mission has been to adhere to these first three traits, and while we cannot claim adherence to the forth, we do strive to operate with an “Off Wall Street” mentality. 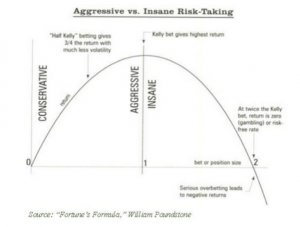 The combination of a low turnover strategy, with a focus on fundamental valuation is consistent with Bogle’s studies and the points that make “passive” an effective strategy when compared to “active.” In that vein, we think of our strategy as “actively passive” for how it combines the benefits of passive strategies, with its own active twist to enhance returns and better manage risk. In the tangible arena, we deploy several screens focused on quality, value, the intersection of quality and value, and ownership structure. We scrutinize these various screen outputs using our knowledge and framework acquired in our abstract idea generation process. This helps us focus on ideas we think most worthy of our attention and to filter out ideas that do not reconcile with our broader understanding of the world today. We don’t think of intrinsic value as any one price; rather, we view it as a range of possible outcomes. Our first priority in any valuation analysis is to work backwards and ascertain what the market is implying about a company with regards to its cash flow yield, growth and cost of capital over time. We don’t think any particular valuation technique is the one and only appropriate technique. It is our belief that prudent valuation analysis is a three-step process: first, one must solve for the embedded assumptions in a stock’s price relative to its value; second, one must ascertain which valuation technique is most sensible in a given situation; and third, the appropriate technique must be applied. In some situations, more than one technique may be appropriate. This first step of inversion is an important starting point in all of our analyses for it provides the benchmark to which we can compare the numbers we calculate and the qualitative elements we consider. We rely on several valuation techniques, including: earnings power value, discounted cash flow analysis, comparables analysis, internal rate of return analysis, implied multiple calculations, and franchise value analysis. In our understanding, all valuation relies on asset value, cash flow, and the relationship between the two with regard to the stock’s price. To that end, we focus extensively on business metrics pertaining to asset value, cash, cash flow, and the returns a business can generate on both its existing asset base and on continued deployment of new capital. To paraphrase the Innovator’s Dilemma: financial analysts have intuition for valuing resources, investors need intuition for valuing both resources and processes. It is in the processes that a company earns their franchise value. Our checklist is designed to decompose the important elements of both the resource value and the franchise value. In our checklist, we look at valuing the company’s income stream, the quality and value of its balance sheet, management’s business strategy and track-record on capital allocation, the industry’s competitive dynamics, the growth trajectory of the company, the ownership structure of the business, a look at any imminent catalysts, risk factors impacting the business, technicals of the stock price and behavioral questions. Our bias is towards companies that demonstrate growth at a reasonable price (GARP), and we think the traditional industry divide between growth and value wrongly implies that the two are mutually exclusive. Growth is a factor which provides an important margin of safety for long-term investments. In our ideal scenario, we can buy a company whose valuation is reflective only of its existing earnings power, with growth providing a call option of sorts to skew our returns asymmetrically in the positive direction. We operate what we would call a moderately concentrated portfolio. We target 25 total positions, with a standard deviation of 5. Our top 10 positions will consistently account for around half of our portfolio. We sometimes build individual positions with more than one security (for example, we might own a stock itself and call options on the stock), though we view this as one position, not two for the purposes of our 25 position target. When we develop a broader thesis worthy of conviction, we will target a portion of our portfolio towards that thesis, but divide the allocation amongst several separate and distinct securities. The typical approach to diversification is unidimensional, with little concern for the correlations or interrelations amongst those diverse elements. Further, much diversification willfully overlooks the fact that an overly broad allocation will inherently include investments unworthy of consideration. Our portfolio construction uses what we would call stratification instead. We want to stratify variables like sector, geography, duration of a given investment, valuation approach, yield and even our theses. We make sure that at all times, our portfolio has some kind of exposure to each unique given area. With regard to our theses, we think it’s important to diversify both the risk factors of all our investments and the upside factors that can drive performance. We constantly and dynamically test the dispersion of the factors that drive risk and reward in each and every position. Along these lines, we place a priority on diversifying the magnitude of risk across our positions. The problem with using the Kelly Criterion alone in position sizing is that it leads to far too much volatility. As such, we use Kelly Criterion more to provide a binary yes/no indicator of whether the balance between risk and reward is worthwhile given our subjective understanding of the probability of a positive outcome. If we get a positive answer from our analysis, then we will make the investment. 5% positions are reserved only for our highest conviction ideas, with the greatest probabilities of a positive outcome. 3% is our core position size reserved for investments where the balance between risk and reward is worthwhile. Typically we define such positions as situations where we can quantify our reward being $3 per unit of risk, with a probability of a positive outcome being in excess of 50% given our subjective understanding of the investment. 1% is the default size we use when we encounter what we would call an extremely asymmetric opportunity, where the risk is absolutely (a position could end up being worthless), but the payout is above $5 per unit of risk and the probability is around 50%. We will never dedicate more than 5% of the portfolio to such positions. At all times, cash is amongst the largest positions in our portfolio. We do this for the natural balancing effect it has in the cyclical, sine wave path of markets. When markets rise quickly, our cash balance as a percent of the portfolio naturally declines, encouraging us to think about selling a position in order to return cash to target levels. In declines, the cash balance as a percent of the portfolio increases as the portfolio drops. This encourages us to put more cash to work. This process is based off of Claude Shannon’s (the father of Information Theory) investment strategy built largely upon the rebalancing effect. While we do not believe volatility itself is risk, we recognize the behavioral limitations of us humans to make prudent decisions in the face of volatility. To that end, we target a portfolio Beta of no more than 1 (inclusive of our cash position). 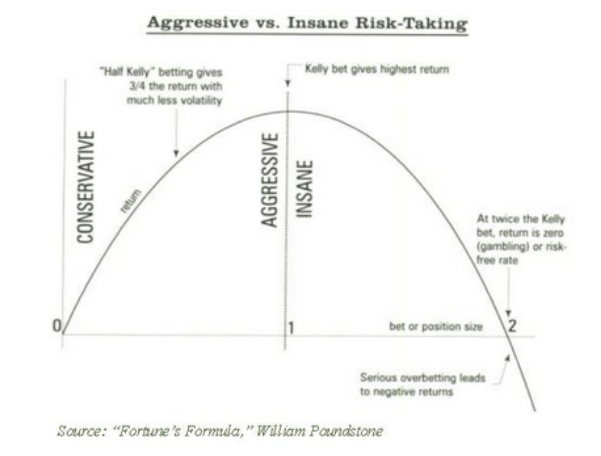 Consistent with our emphasis on the Kelly Criterion we operate under the belief that risk = Hazard x Exposure, where hazard is our potential for being wrong and exposure is how much we stand to lose should an investment experience a loss. We do this analysis on both an individual security level and a portfolio basis, while our portfolio composition is designed to mitigate all of these risks as much as possible. Each and every individual investment is analyzed intently to determine its potential risk on a fundamental basis. This risk is reassessed dynamically as time and events evolve. The portfolio is constructed in such a way as to limit the correlation of risks between investments. Our goal is to maximize the total number of risk factors our portfolio is exposed to, such that no one factor can inflict too much damage, and in doing so, we aim to help minimize the correlation amongst the performance in our positions over time. We view risk management as a dynamic endeavor, which involves constantly testing and retesting any assumptions underlying our quantitative and qualitative analysis. We also view it as a systemic endeavor, whereby consistent and prudent processes in and of itself serve to mitigate overall risk. While these are our strategies and beliefs, we are constantly striving to improve ourselves and our processes. We believe wholeheartedly in Charlie Munger’s notion of “worldly wisdom” and the pursuit thereof, which calls for “building a latticework of models” to deploy in various situations. Our strategy overview starts with a description of markets as Complex Adaptive Systems because to us, it is essential to recognize how dynamic and subjective the process of valuation analysis and investment can be. Without recognizing this reality it becomes too easy to fall victim to the behavioral forces that operate on market participants every day. Stated simply, we operate a GARP strategy; however, we believe our diverse set of models and diverse worldview make for a unique and robust approach that does not fit neatly into one label. Further, we believe our fully integrated approach of starting with a theory for how markets operate, executing a flexible but disciplined valuation strategy, and deploying holistic portfolio construction combine to create a positive feedback loop for compounding capital into the future. RGA Investment Advisors LLC (“RGA”) has provided these materials (together with any accompanying oral presentation and supplementary documents provided therewith, the “materials”) for information purposes only. The materials are not intended to be, and must not be, taken as the basis for an investment decision. The materials are necessarily based upon economic, financial, market and other conditions, and information available or provided to RGA, in each case, existing as of the date of this report (unless otherwise specified) and, accordingly, should be regarded as indicative, preliminary and for illustrative purposes only. In its preparation of the materials, RGA has assumed and relied upon, without assuming responsibility for independent verification of, the accuracy and completeness of all such information. RGA does not assume any responsibility for independent verification of such information and makes no representation or warranty, express or implied, as to the accuracy or completeness of such information. Although subsequent events may affect the accuracy and completeness of the materials, RGA assumes no responsibility for updating or otherwise revising the materials, and the delivery of the materials will under no circumstances create any implication that the information contained herein has been updated or corrected. The materials should not be construed as investment, legal, tax or other advice, and you should consult your own advisers as to legal, business, tax and other related matters concerning an investment decision. Past performance is not indicative of future results. The materials do not constitute an offer to sell or a solicitation of an offer to buy any security and may not be relied upon in connection with any purchase or sale of securities. Forward-looking information contained in the materials, including all statements of opinion and/or belief, are based on a variety of estimates and assumptions by RGA, including, among others, market analysis, estimates, projections and similar information available or provided to RGA. These estimates and assumptions are inherently uncertain and are subject to numerous business, industry, market, regulatory, competitive and financial risks that are outside of RGA’s control. There can be no assurance that the assumptions made will prove ac- curate. Neither RGA nor any of its affiliates or representatives has made or makes any representation to any person regarding any of the potential transactions described herein, including that any of such transactions can or will be completed or, if completed, that they will be completed on the terms described herein. The materials contain confidential, proprietary, trade secret and other commercially sensitive information, and shall be kept strictly confidential and not disclosed or disseminated to any other person or entity or used. The returns contained herein with respect to unrealized investments are being provided for informational purposes only and are not intended to be indicative of any future performance of such investments. IRR represents, on a net of fee basis, the aggregate compound annualized return rate (implied discount rate) attributable to the portfolio being referenced, which has been calculated using all cash inflows and cash outflows affecting the referenced portfolio. This entry was posted in Commentary on March 11, 2015 by RGAIA.